Meet Darby. She's 8 years old and as sweet as could be - and in desperate need of a family who'll love her forever. 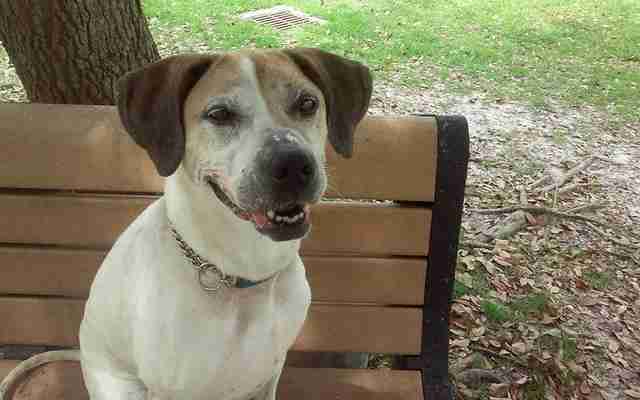 The Brittany-hound mix has been in the care of Collier County Domestic Animal Services (DAS) in Naples, Florida, since December. Her owner made the very difficult decision to give her up when he felt he could no longer provide the care she deserved. "There are many reasons why dogs are surrendered, but Darby's was particularly heartbreaking," Mary Jones, a volunteer at DAS, tells The Dodo. "Darby's owner fell upon financial hardships. He lost his home, and was living out of his car for a couple months, Darby all the while at his side." Eventually, it all got to be too much. He knew Darby deserved better. And that's exactly why she's currently looking for a new home. "Reluctantly, he realized this was no life for her, and he knew he had to give her up," Jones says. 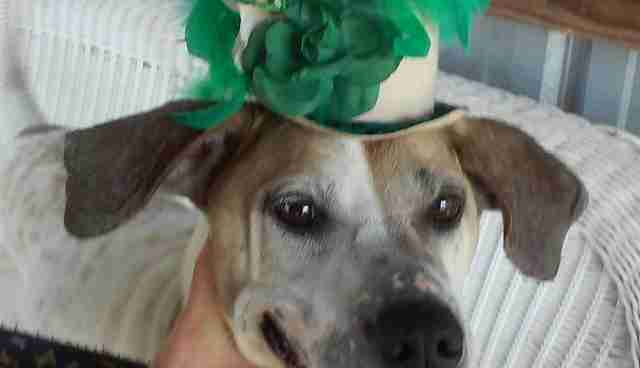 "When he brought Darby to the shelter, he was in tears. He had the entire DAS staff in tears too." Like so many dogs surrendered by their owners, Darby went through a "mourning period." But after receiving medical treatment, meals, walks and playtime, she eventually got more comfortable at the shelter. And she certainly was not shy around the other dogs. "In fact, I think she feels as though she is the Grand Dame since she is the oldest dog there," Jones says. "She barks at many dogs as she makes her way to the yard. She is a free spirit." 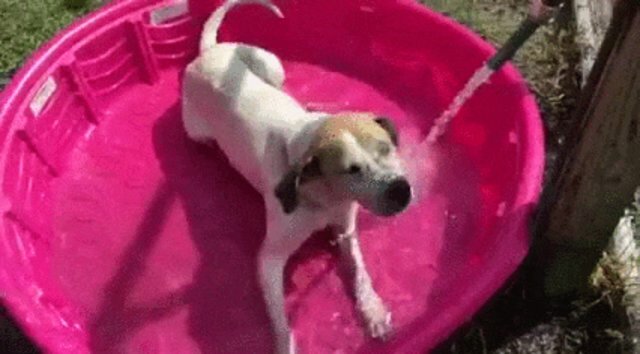 Shelter staff quickly noticed that one of Darby's favorite things to do was play in kiddie pools. 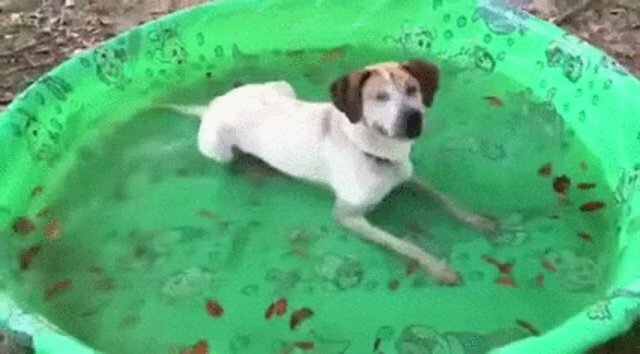 When they'd let her out into the yard, she'd make a beeline for a pool, where she'd just roll around and enjoy the water. No, seriously, she loves kiddie pools. Recently, Jones decided to take Darby out of the shelter for some adventures. For an entire day. It was Darby's Day Off. First, she went to an event at a local pet store where she enjoyed lots of attention. Next she went to a community block party where she graciously accepted lots of petting and hung out with other neighborhood dogs. Then Darby got to visit Jones' house. And guess what Jones has at her house? A pool. A big one. It even has a slide - and you better believe Darby gleefully went down it. You can watch the full video of Darby's pool session on the group's Facebook page, which is run by volunteers. Darby got to splash around, soak up the sun and just chill. For one day, she got to experience life outside a shelter. This is the life she deserves every day. 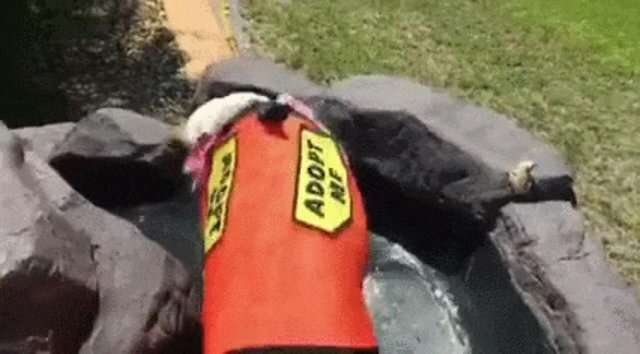 "Seeing a shelter dog going on a 'field trip' is so heartwarming," Jones says. "They act so completely different once they are outside of the shelter environment." Now, it's time for Darby to find a new home. Maybe even one with a pool, where she can continue to be her fun-loving, free-spirited self. Because Darby is a senior dog, she's at a disadvantage when it comes to finding a new home. But she clearly would be a wonderful, loving addition to any family. Darby is spayed and current on her shots. 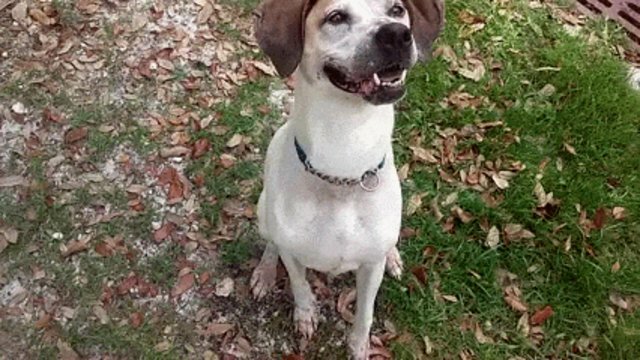 If you're a rescue or individual interested in Darby, you can contact the Collier County Domestic Animal Services on Facebook or at 239-252-PETS.